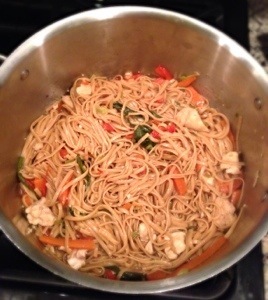 One Pot Chicken Lo Mein | Chrissie Cooks?! In my experience, one pot cooking has always consisted of soups, and stews, and chili (which I guess is some combination of a soup and a stew, if you really think about it). But this “One Pot Wonder,” as Amanda at The Wholesome Dish calls it, is on a whooooole ‘nother level. …and simmer it for 15 minutes. 15 minutes. And then you eat it. And then your mind is blown because you can’t believe you just threw together a meal that good, that quickly, and you only have one pot to clean. The future is here, folks. 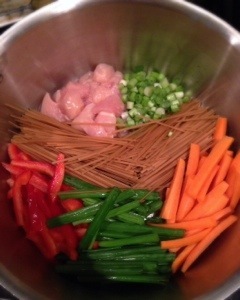 Place chicken and pasta in large stock pot. 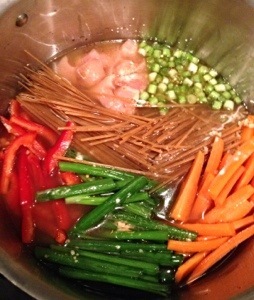 Add carrots, red pepper, and green onions in the remaining space in the pot. Add all remaining ingredients. Cover and bring to a boil. Stir, reduce heat, and simmer, covered, for 15 minutes, or until most of the liquid is gone and chicken is fully cooked through. I have been making “one pot wonders” for years both on the stove and in the Cockpot. But, I never thought if using pasta! What a great idea! Will be making this for dinner! Thx! I hope you like it as much as I did! Let me know how it turns out for you. Chrissie it was delicious! Jim loved it too! May I share your blog? If so, how do I do it fro my friends on Facebook? Have a nice week! Oh I’m so glad you liked it! There should be a button at the end of the post that says “Facebook” — click that to share it!